CareWell Services Southwest provides free MMAP (Medicare & Medicaid Assistance Program) Benefits Counseling to assist seniors in Calhoun County with Medicare, Medicaid, Part D and other insurance needs. 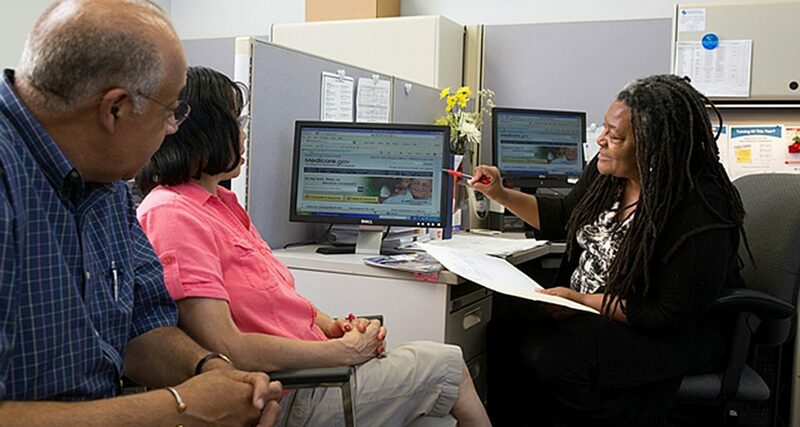 Benefits Counselors have been trained in Medicare, Medicaid, and other insurance products. They also assist seniors who are unaware of programs they may be eligible for such as the Medicare Savings Program to pay their Medicare Part B premiums, and the Extra Help Low Income Subsidy program which reduces prescription co-pays for eligible seniors. Through the counseling process for Part D, seniors have the opportunity to learn about other beneficial programs that are not well publicized. Counselors provide unbiased education and assistance and are not connected with any insurance company. Call 1-800-803-7174 to speak to a counselor to schedule an appointment. Most MMAP counseling is done by highly trained volunteers, supervised by paid staff. MMAP volunteers receive an initial 36 hours of classroom training about Medicare and Medicaid, then receive monthly web trainings, and quarterly regional trainings, in additional to one-on-one mentoring by regional and site coordinators. Because our volunteers deal with personal information, they must pass background checks. Since we must provide unbiased information about insurance products related to Medicare, volunteers are not permitted to have active insurance licenses. Retired nurses, teachers, engineers, and other professionals often find the ongoing education and problem-solving challenges of MMAP volunteering to be very rewarding! If you enjoy learning new things, would like to make a difference in your community, and are able to commit to volunteering a minimum of five hours per month for at least one year, please contact our MMAP Regional Coordinator at: 269-441-0931, to learn more about how you can join the MMAP team. The MMAP Senior Medicare Patrol, called “SMP,” is a free service with the goal to promote awareness of Medicare error, fraud and abuse and to help resolve problems identified by people who have Medicare. Trained SMP volunteers are available for educational presentations around the community about Medicare fraud detection, prevention, and reporting. Please call MMAP at 1-800-803-7174 to contact SMP, or to learn about volunteer opportunities with SMP. The medicare.gov website may instruct visitors to consult with their local SHIP program. In Michigan, the SHIP program is called MMAP, the Medicare/Medicaid Assistance Program. By calling 1-800-803-7174, you will be referred to the MMAP office located nearest to your home.